Transgender Army officer Hannah Winterbourne has said her wedding day has been "marred" by "offensive headlines" from the Sun newspaper. 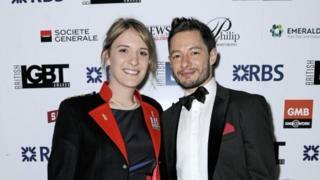 Captain Hannah and her new husband, trans actor and director Jake Graf, featured alongside the headline "Tran and wife" and other references to their former genders. "(Hannah) was never a man, as I was never a woman," Mr Graf has said since. Most people had acknowledged the story was a positive one, the Sun said. The couple praised the "positive article" featured in the newspaper about their marriage earlier this month, but said the headline was "sensationalised and misleading". According to the article, the newlyweds first got together after Mr Graf spotted his future wife on another Sun front-page story in 2015, about her decision to transition while in the Army. Capt Hannah went on to become the most senior transgender officer in the service. The front page faced a backlash online with some stating a "beautiful trans moment" had been "turned it into prejudice", while political magazine the New Statesman branded the newspaper "transphobic". Former minister from Women and Equalities Nicky Morgan said: "Ignore them - many congratulations and best wishes for married life together." Mr Graf said another newspaper had been in touch to ask about his "dead name" - the name he was known by in his former gender. When a trans person obtains a Gender Recognition Certificate (GRC) they legally identify with their preferred name and gender rather than their assigned one. The Daily Express said it would not comment on the tweet. A Sun spokesman said: "We don't think there's anybody that could come away from reading the feature on the front and the inside spread and not wish the couple the best for the future. "We've got an ongoing dialogue with the LGBTI community and always strive to ensure our stories are received in the way we intend. "Jake and Hannah's is a wonderful story and we hope they have every happiness."